Boeing’s new 787 finally carried its first passengers, and the aviation industry has called the 787 a “game changer” aircraft. In many ways it is. It’s the first big jet to be built substantially out of composites rather than aluminum. It uses the latest, most fuel-efficient engines, featuring less noise and fewer emissions than current engines. Although smaller than the 777, the 787 has (or will have) an extremely long range. And Boeing claims some important innovations in passenger comfort. But what part of the “game” changes for you as a passenger? Presumably, the most important gain will be in the airlines’ ability to fly economically on routes that will allow you to bypass major hubs and avoid connections—routes with less direct traffic than airlines can efficiently serve with the larger 747s, 777s, A340s, and A380s they now use for long-haul flights. 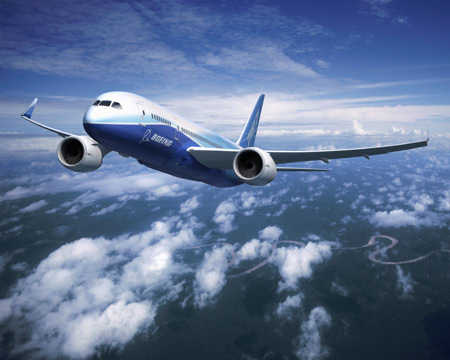 The 787 is about the same sized as a 767, but it can fly much farther—and at much lower cost per passenger. That means nonstop services from second-level U.S. cities to major worldwide hubs, and from large U.S. cities to second-level cities in Europe and Asia. Typical routes might include Boston-Zurich, Portland-London, and Kansas City-Tokyo. Clearly, the ability to avoid one or even two connections on a long international flight could be a major advantage, shaving two to five hours off the best connecting schedules. Boeing also claims some advantages in the cabin environment: The 787 is pressurized to a lower altitude (6,000 feet) than most other jets, so you won’t have so much ear-popping. It will provide higher-humidity cabin air, which means less dry skin and fewer nasal problems. Windows are larger than on current jets, and dimming will be electronic rather than fabric shades. And Boeing makes extravagant claims about how its LED lighting system will be able to adjust to your mood—raising the question about just what sort of lighting is appropriate for a delayed flight. As to the seating, that depends on how each individual airline decides to outfit its planes. ANA, the first airline to take delivery and fly the 787, has arranged economy seating at eight-across, in a 2-4-2 arrangement, similar to the way most airlines configure their A330/340s. Because the 787 cabin is 15 inches wider than those Airbus models, its economy seats should be roomier—and much better than you find on 747s. Some lines, however, will install seats at nine-across, which will be as narrow and undersized as current 737 and 747 seats and far too tight to accommodate American men comfortably. Where will you be able to fly 787s? The 787s combination of size and range means you’ll see it mainly on international routes, at least at the beginning. In fact, Boeing dropped an early design it had once offered for short-haul service. Currently, Boeing has just under 800 orders for the 787, mostly from overseas or from leasing companies. The deliveries scheduled for this year are to ANA (already flying) and JAL; North American airlines to order the 787 are Air Canada, Continental/United, and Delta, but none of these lines will take delivery until next year at the earliest. If you’ve followed the industry reports at all, you know that the 787 is several years behind schedule. Also, the first models are a bit overweight, meaning Boeing still has some design tweaking to do. As a result, Boeing has lost much of the initial advantage it enjoyed over the rival A350, which also uses some of the same technology as the 787. The competitive battle will be fierce for years. Will the 787s 20 percent reduction in operating cost translate to lower fares? Probably not, at least none that you might identify. But the lower costs should help avoid fare increases that will almost surely be the norm for several years. Overall, I’m optimistic about the 787 and A350. But, like you, I’ll have to wait for a hands-on trial.